One of our favourite Chinese restaurants in town serves the best raw papaya, marinated with lemon juice and sugar as a welcome starter. Since I craved Chinese food from this particular place in my pregnancy, we ended up in this place quite often. And as soon as we were comfortable in our seats, came this wonderfully marinated papaya along with honey chilli cashews. In India, generally we do not consume Papaya during pregnancy. So this meant that I could not have it, while Ro ate a few pieces. As I looked at the Papaya tree at my parents, I craved for something made with raw papaya. And now since I’m out of a prenatal and for that matter a post natal diet, there was no stopping me. Making this salad, made me realize the importance of simple steps which contribute a great deal to the finished preparation. 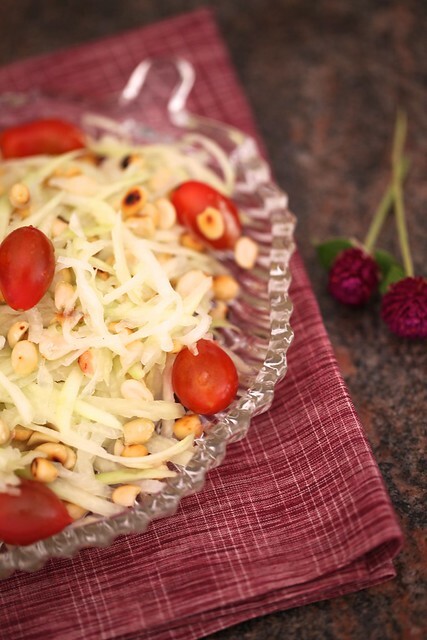 I made this salad the first time without thoroughly chilling the grated papaya. Although it tasted good, it turned limp and the papaya didnt quite absorb the flavours of the dressing ingredients. The second time I made it a point to properly chill the papaya which resulted into a crisp, flavourful and fresh tasting salad. 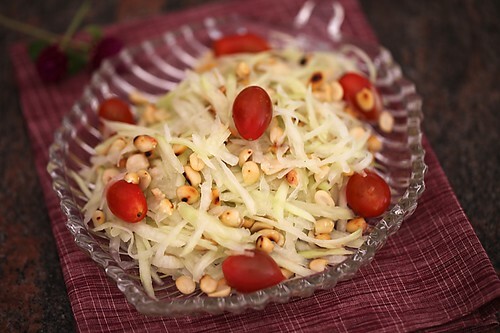 The dressing held on to the papaya and gave a sweet, sour and slightly pungent note to the palate. 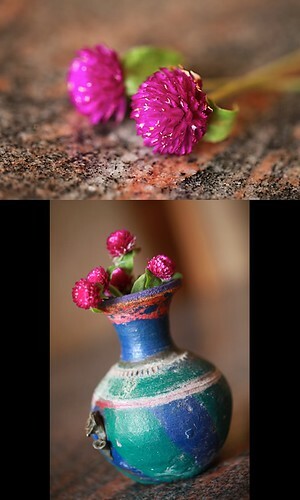 This is so easy to make and quick to put together. The ingredients are few and ones that are usually available in a pantry. The soft and juicy cherry tomatoes are a perfect foil to the crunchiness of the peanuts. A Thai curry like this paired with aromatic rice would be the perfect match to this wonderfully crisp and flavourful salad. Peel and grate the papaya with a grater having large holes and place in the refrigerator to chill. If you are in a hurry you can place them in the freezer, but make sure that the papaya is thoroughly chilled. In a small bowl blend all the dressing ingredients for the salad. Toss the tomatoes and peanuts into the chilled papaya and mix in the salad dressing. Tastes best when served chilled. I also craved for authentic chinese while i was expecting:). My boy just completed 10 months today. 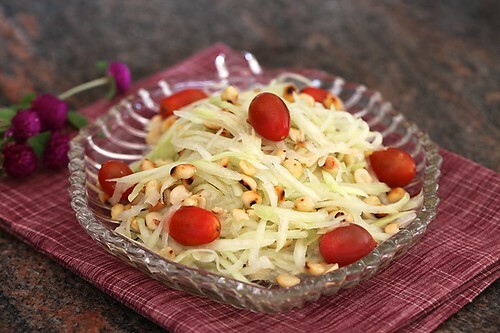 Salad looks refreshing..should try it out. Lovely photographs and you look amazing in your profile. 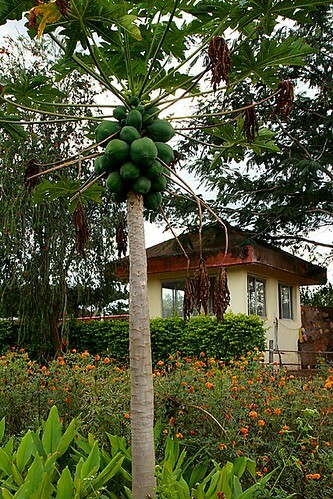 This is the first time I've ever seen a papaya tree. It's beautiful. So is the recipe! Christina: Hope you enjoy this salad when you make it. 10 months of motherhood must have taught you a lot of lessons in life. 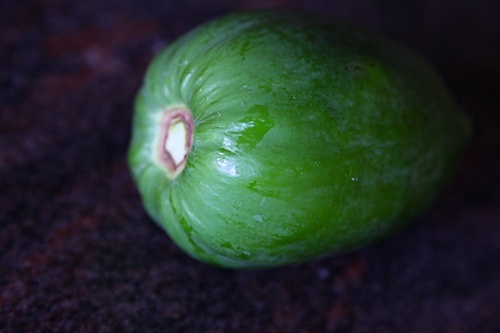 El: It is so wonderful to see fruits and vegetables in their native form…isnt it? A small request , can you do a photo tutorial of how to use agar flakes in desserts. I've tried using agar in pannacotta & ended up making clumpy lumpy mass . Interesting Recipe and will try out this one for sure ! Samatha: Soak the agar agar flakes in cold water for at least half an hour. Cook on low heat by stirring continually until it dissolved completely. Pour the hot melted agar agar solution over a strainer into another liquid mixture which is warm or hot. Never pour hot agar agar into a cold mixture, which will make the agar agar clump. This should give you a well set dessert. Refer my mango cheesecake for details. Will try and post video too, but I hope this helps till then. Marcy: As I have mentioned in this post, this would go great with some plain rice, Thai jasmine rice and a Thai curry. I have even given links above. This salad would be great with any Asian main course too. Tried this yesterday and it was lovely:D. I used cider vinegar since i didn't have lime and a sprinkle of toasted sesame seeds as i was lazy to work on the peanuts :). Thanks for the inspiration. Christina: That sounds great! Glad you enjoyed it!